Lately, I’ve been slightly obsessed with making cute food. I pretty much love every miniature thing, but cute food has always held a special place in my heart. After all, what’s better than food that makes you smile, not only because it tastes good, but also because it looks adorable as well? With the Christmas season quickly approaching, I’ve been having a blast coming up with cute little holiday-themed food ideas. 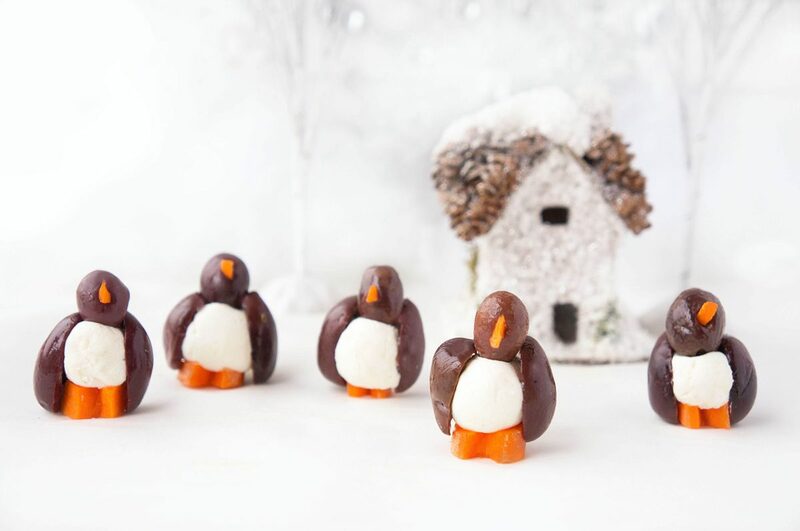 Last week, the featured holiday recipe were these No-Bake Reindeer Energy Bites and this week, we’ve got some adorable Olive & Goat Cheese Penguins! I mean, how cute are these?! I’m not gonna lie. A part of me likes coming up with these ideas just so that I can take pictures of them. That’s one of the reasons why I love food photography and blogging so much — you get to be as creative and have as much fun as you like! 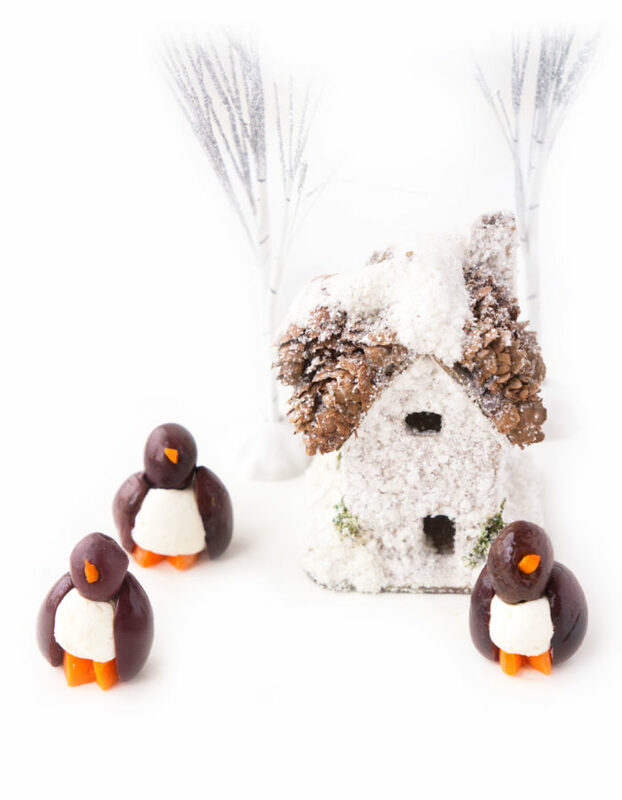 And did I mention that these little Olive & Goat Cheese Penguins can also serve as edible decor as well? Set them up next to a little Christmas village, surround the tray of penguins with sparkly snowflakes, or put them next to a mini Christmas tree. 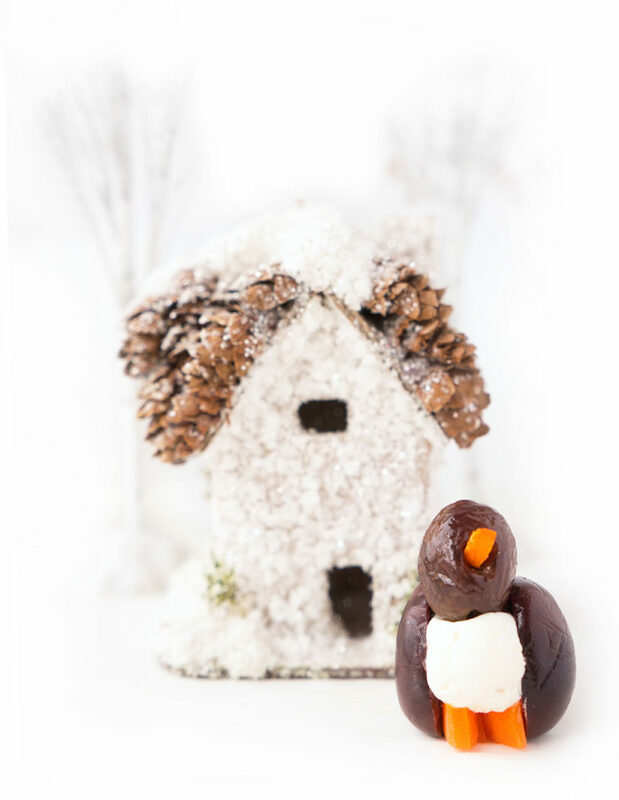 I guarantee your guests will ADORE these little guys. You can even take it a step further and add some accessories to the penguins like a roasted red pepper scarf or a mini tomato hat! Food, fashion AND decor?? Sign me up! 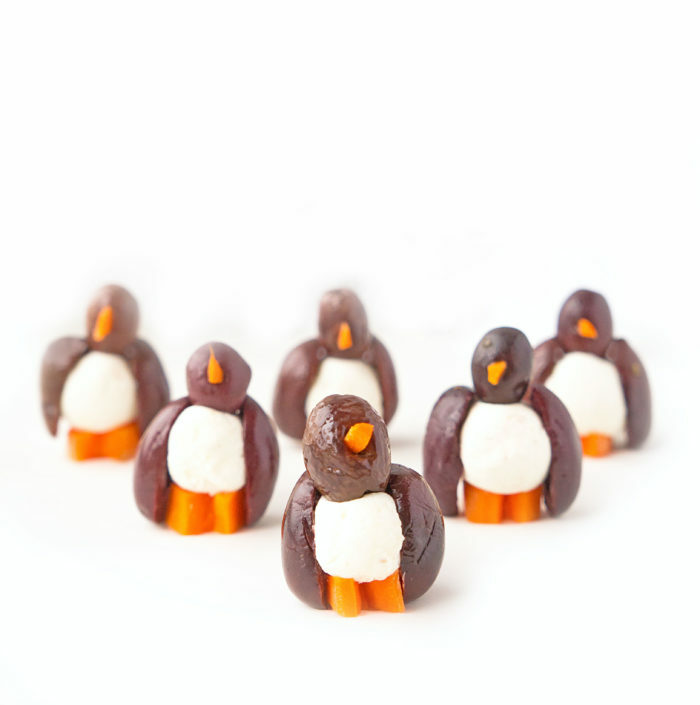 Not only are these penguins super fun to serve, but they’re a tasty little bite to eat as well. The creaminess of the goat cheese compliments the saltiness of the olives so nicely and then of course, you get a little crunch from the carrots too. They’re also a healthier option that serve as a source of healthy fats, vitamin A and protein. Can’t go wrong with that! So how do you make these little Olive & Goat Cheese Penguins? It’s really simple — I promise! Purchase some kalamata olives with or without pits. I went with the ones with pits since I liked the shape of them better, but it’s totally up to you. I bought large olives for the body and smaller ones for the head of the penguin. Next, cut the large olive in half lengthways. Remove the pit if necessary. Each olive half will serve as the penguins’ wings. Get your goat cheese out and roll into balls about half an inch in diameter. Cut a slice of carrot about a quarter inch thick. Cut a little triangle out of the carrot slice. These carrot slices will serve as the feet and the little triangle will be the beak of the penguin (you might need to trim the triangle down a bit to work as a beak). I recommend putting them directly on the serving tray right after you’ve formed each penguin so that you don’t have to move them around too much and store them in the fridge until ready to serve. Just a word of warning — these penguins do take a little time to assemble, especially if you’re making the whole batch, so I recommend getting a few people involved in the penguin making process if possible to make it go even quicker. If you’ve got some time on your hands, by all means, rock out to some Christmas music and make some new penguin friends! 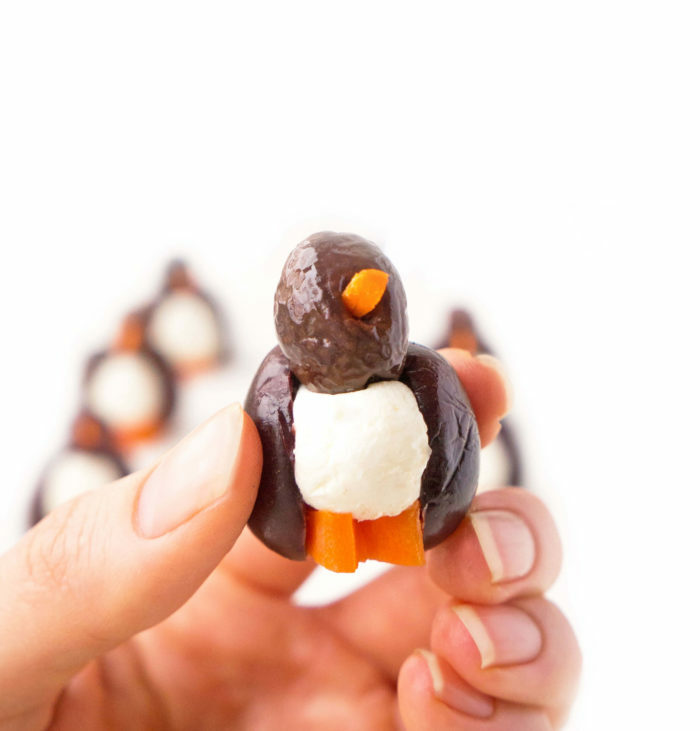 And there you have it — super adorable penguins that serve as the perfect festive holiday appetizer! Purchase some kalamata olives with or without pits. I went with the ones with pits since I liked the shape of them better, but it's totally up to you. I bought large ones for the body and smaller ones for the head of the penguin. Next, cut the large olive in half lengthways. Remove the pit if necessary. Each olive half will serve as the penguins' wings. Get your goat cheese out and roll into balls about ½ inch in diameter. Cut a slice of carrot about a ¼ inch thick. Cut a little triangle out of the carrot slice. These carrot slice will serve as the feet and the little triangle will be the beak of the penguin. 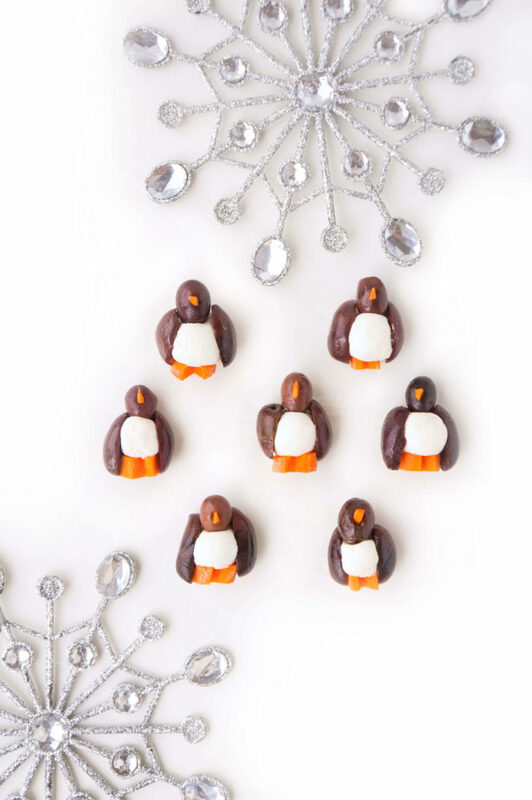 Place them directly on the serving tray right after you've formed each penguin and store them in the fridge until ready to serve. 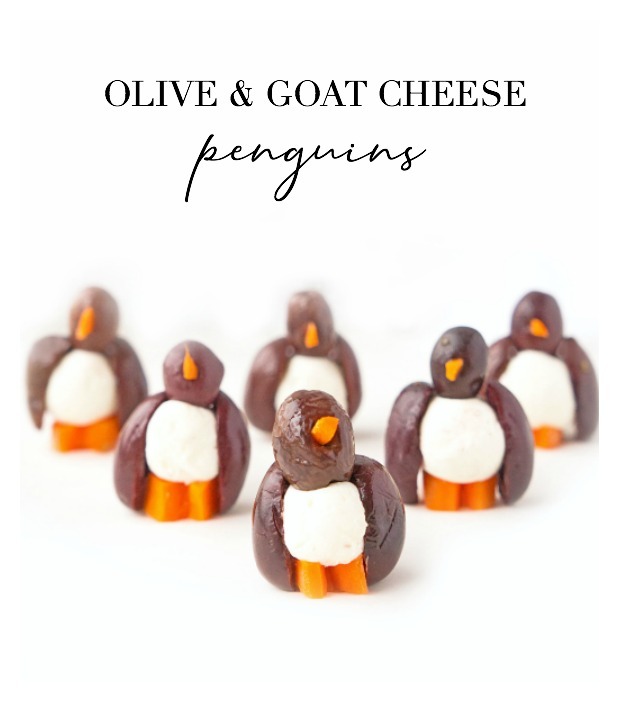 ** If you'd like to secure the penguin together, you can always poke a toothpick through the goat cheese ball, carrot slice and olive head to keep it all together, but I found that the goat cheese almost acted like a glue keeping it all in place. Just don't meddle with the penguins too much or they'll fall over and might lose their head!